Community Archives - Page 3 of 3 - STAND UP TO STIGMA MENTAL HEALTH PEER SUPPORT GROUPS - Albuquerque, New Mexico - Depression Bipolar Schizophrenia Anxiety etc. DBSA Albuquerque will not be holding peer support groups on Monday, July 4, 2016, in celebration of the Independence Day holiday. If you would like to attend a peer support group on Monday, July 4, NAMI Albuquerque Connection meets at 6:30 PM at the NAMI Albuquerque office near Menaul and San Pedro. DBSA Albuquerque co-president Steve Bringe will be co-facilitating the Connection group on Monday. Our Monday support group will resume on Monday, July 11, at the regular time and place. Please join us at the June 2016 MHRAC Public Meeting at the Rock at Noon Day. DBSA Albuquerque Co-President Steve Bringe sits on MHRAC as a peer representative. “Laugh It Off” is one of five new mental health education programs DBSA Albuquerque is offering, beginning this June with full roll out by September. We’ve given four presentations for “Laugh It Off” now, and I’ve been asked by a few folks to give an idea of what kind of jokes our comics are sharing. I don’t have the go ahead from the other comics to share their material, so I’ll share one part of my set. Here goes. There’s a group of peers in our community who don’t get a lot of recognition, and that’s kids growing up with a parent who has mental health issues. I’ve got my own son, Scott, and he’s the greatest kid ever. Still, it was rough on him having to live with me as I struggled to get the bipolar stuff under wraps so I could be a parent to him. And sometimes it wasn’t so great, like when I’d tell him that when the ice cream truck was playing music it meant they were out of ice cream. My kid is smart. Even at 4 years old he knew enough that I was full of crap about the ice cream truck. And, he was his own form of sadist. One morning, I woke up to take my meds, only I didn’t find my meds, I found big, melty wads of ice cream stuff into my med bottles instead. DBSA Albuquerque will be at the New Mexico Crisis and Access Line Health Fair this Saturday in Albuquerque. The NMCAL Health Fair is an opportunity for our communities to learn and understand more about mental health and behavioral health, how it impacts our everyday lives and how it is seen in our everyday lives. DBSA Albuquerque is one of many organizations and agencies attending this Saturday. Drop by our table and say howdy! We’ll have many peers from DBSA Albuquerque at our table throughout the day, and they’re excited to share more about themselves and our chapter with you. The Depression and Bipolar Support Alliance Albuquerque Chapter is a 501c3 volunteer organization. DBSA Albuquerque Resources Page – Let Us Know You’re Out There! Howdy, Greater Albuquerque Metropolitan Area and New Mexico Communities! We’re currently completely overhauling our chapter website, and a big part of the upgrade is getting our Resources page current and extensive. So, if you have a website you believe would benefit the community, send it along for inclusion on the DBSA Albuquerque website. There is a review process with the DBSA Albuquerque board, and we accept pretty much all submissions we receive. Good news for bibliophiles! DBSA Albuquerque is holding a monthly book club meeting the last Tuesday of every month, the first peer-led book club of this type and scope offered in the Greater Albuquerque Metropolitan Area. Members can be peers, families and friends, and other individuals who find helpful camaraderie in entertainment that fosters understanding and compassion. The DBSA Albuquerque Book Club is free of charge for all members. The first DBSA Albuquerque Book Club meeting is on Tuesday, April 26, 2016, from 7 PM to 9 PM. The first book for members is “Stranger in a Strange Land” by Robert A. Heinlein. Contact Rasma Cox, DBSA Albuquerque Book Club committee chair, for more information. The Albuquerque Behavioral Health Community scored a big win for our city the last two weeks. On Friday, April 4, the training manual for the “Perspectives in Psychosis and Mania” and “Crisis Deescalation” developed in collaboration by APD Detective Matthew Tinney, APD Psychiatrist Nils Rosenbaum, Robert Salazar (Peer Advocate/NAMI Albuquerque board member), Rasma Cox (Peer Advocate/DBSA Albuquerque Chapter Co-President), and Steve Bringe (Peer Advocate/DBSA Albuquerque Chapter Co-President) was put into action at the Albuquerque Police Department’s Crisis Intervention Team training. This training manual, which has been submitted to the Department of Justice in accordance with the APD settlement agreement (and includes a byline credit for DBSA Albuquerque Chapter’s role in developing the manual), brings peers and law enforcement together to prepare better Albuquerque police officers for safe and positive encounters for all involved in a mental health crisis situation. The Crisis Intervention Team (CIT) is 40 hours of APD training that focuses on education, insight, understanding, and successful outcomes for interactions between police officers and individuals contending with mental health issues. With the “Crisis Deescalation” presentation, we share with officers specific instances where our crisis situation led to law enforcement becoming involved. The goal for this presentation is through our lived experience and stories we can convey to police officers what works well in crisis situations, what must be avoided, and what could use improvement. Police officers comment that this sort of practical information they could get in no other way than our willingness to share openly what it is like to live with the symptoms of a mental illness. Our collaboration with APD has extended beyond the CIT classroom. And abbreviated format of “Perspectives” and “Deescalation” was tried out with Project ECHO. ECHO is in response to the geographic factors of getting psychiatric services to the remote populations of New Mexico. Providers, case workers, peer support organizations, etc., cannot fulfill the needs of peers in remote communities, primarily because of the time it takes to travel from large population areas like Albuquerque to small, isolated communities like Reserve in Catron County (it is estimated that the elk population of Catron County outnumbers the human population of Catron County). ECHO utilizes a audio/video network of live cameras, display screens, local coordinators, and a secure communication system to bring necessary services to peers in these remote communities. The connection is made between provider and peer via ECHO. Detective Tinney and Doctor Rosenbaum came up with the ingenious idea of using ECHO to train law enforcement in these remote communities. They have been beta-testing ECHO CIT training and two Fridays ago Rasma Cox and Steve Bringe were invited to present “Perspectives” and “Deescalation” to law enforcement in Rio Arriba County, San Juan County (Farmington), Dona Ana County (Las Cruces), and two other law enforcement agencies. 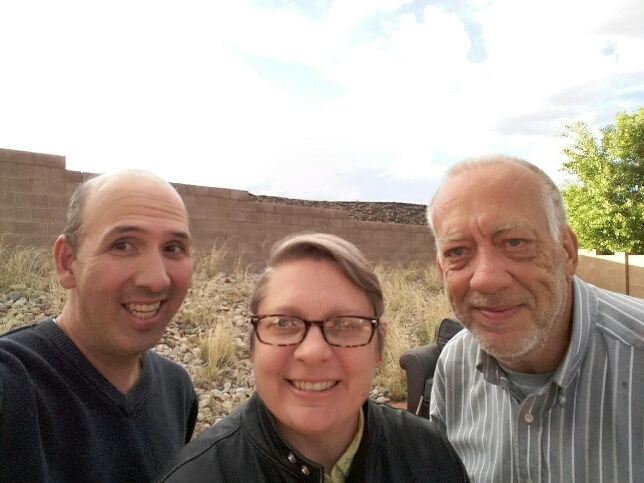 Many excellent questions were asked to Rasma and Steve, and based on the success of this first ECHO peer presentation, DBSA Albuquerque has a continued invitation to participate in ECHO CIT training from Albuquerque. There is much more to share about DBSA Albuquerque Chapter’s excellent collaboration with the Albuquerque Police Department and other lawn enforcement agencies around the State of New Mexico. As a final teaser about a quickly developing ECHO project spearheaded by DBSA Albuquerque Chapter, we are addressing the specific logistics of using ECHO for an extended DBSA Albuquerque Chapter support group bringing remote communities together with large population centers to have an ECHO peer support group. DBSA Albuquerque Chapter continues to build on our success of public outreach and education. More soon!